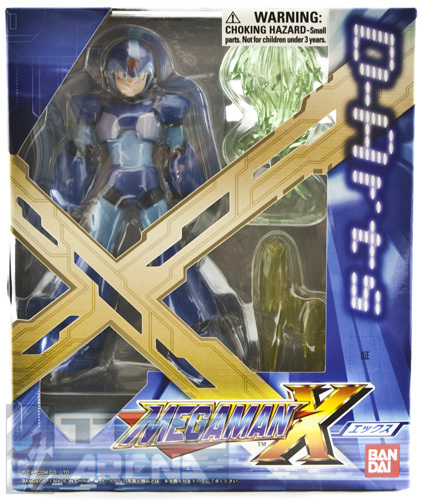 Our friends in Japan have been enjoying Bandai's D-Arts Rockman X action figure for a little over a month now, but within one to three weeks time, we'll have him in our hands. Within the next few weeks, North American retailers will begin to stock and ship out the localized D-Arts Mega Man X. This version touts English packaging (pictured) featuring Mega Man branding, and is said to be far more accessible to purchase than importing from Japan. What's more, Toy Arena and New Egg appear to already have the figure in-hand and ready to ship at a moments notice. The usual stomping grounds for high-end Bandai products -- Big Bad Toystore and Entertainment Earth -- should be stocking X shortly. Of course, other stores intend to stock the figure soon, too. According to Bandai's Adam Newman, any comic/hobby/anime specialty retailers associated with Bluefin (Bandai's distributor in the US), online or not, plan on sell the figure in early June. The English X will run around $39.99, but the price tag may vary a few dollars or so depending on the retailer. Just look around a bit and find a place that fits your budget; sounds like you'll have a lot of options. I actually bought one of the American versions off of eBay last week and received it yesterday. It did end up being a bit cheaper than importing this time around. Other than the change from Rockman to Megaman for the logo, the info on the bottom of the box and the instructions inside are all still in Japanese. There's just a Bluefin distribution sticker slapped on the bottom. So it doesn't look like there really were any major alterations to the packaging for the English release. 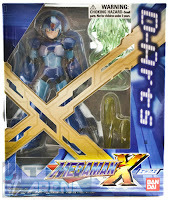 I can attest that it cost $49 (cost + EMS shipping to US from AmiAmi) for my Rockman X. Shipping would have been cheaper if I had chosen SAL, but I chose EMS. Hobbyfan has Rockman X for $35 without ship, and they ship international. I bought from Hobbyfan. I just couldnt wait for the US version. They first said it wold release some time may. now they say June. Glad I got mine earlier. All just so the box can say Mega Man? Im certain interest can be polled just as well by how many international orders there are. Its not like I have any hobby stores or Anime stores near me anyway. I would have to go out of my way to find one. Heh, have you guys seen the stories about the Playstation Vita going around, citing Megarock's blog? Weird to have witnessed it. His blog seems to be down... Anybody heard from him? Hm, never heard of that. Any links or sources for more info, anon?